The Evolution Motorsports engineering team worked overtime to create the ultimate Evolution Motorsport Front Mount Intercooler Kit. CAD designed cast aluminum end tanks allow us to create optimum airflow while ensuring a PERFECT fit for every intercooler that we build. The cast tanks contour the shape of the front bumper which virtually eliminates the need to “hack apart” your front bumper to make our unit fit. 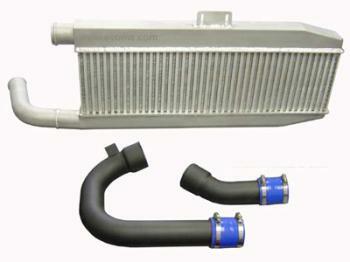 The air flow design of our intercooler core has the MOST EFFICIENT cooling / flow properties available. We designed the plumbing to bolt on to the existing charge air plumbing which reduces the distance of air flow. This direct air flow reduces pressure drop and increases throttle response, boost response and increases power.